A wild and crazy NASCAR Camping World Truck Series race at Talladega Superspeedway last weekend set the Round of 6, as drivers inch ever closer to the season finale at Homestead-Miami Speedway. Every single playoff driver encountered some sort of issue throughout the race, and when the checkered flag flew, the championship battle was reduced to six competitors. How he got here: Simply put, five victories and a grand total of 42 playoff points accumulated put Sauter in a pretty solid position to skate through to the Championship 4, barring a major catastrophe. After opening the year with a victory at Daytona International Speedway, the driver of the No. 21 GMS Racing Chevrolet has led the point standings after every race. Finishes of sixth and second in the first two races in the Round of 8 allowed Sauter the cushion he needed to make up for the 22nd-place finish he posted at Talladega after getting caught up in the Big One. With a 28-point advantage over the cut line and a couple strong tracks in Martinsville Speedway and Texas Motor Speedway ahead, it would be an incredible shock if Sauter wasn’t a part of the Championship 4. How he got here: In the story of the little team that could, Moffitt took the Hattori Racing Enterprises truck that narrowly missed out on trips to Victory Lane last season with Ryan Truex, despite showing the speed to get there, and racked up four wins. Nine top 10s and multiple stage wins put Moffitt in position to have a comfortable cushion in the playoffs, though it wasn’t nearly the advantage Sauter had. Talladega was unkind to the No. 16 team as Moffitt collided with Tanner Thorson with just two laps remaining in stage 2. 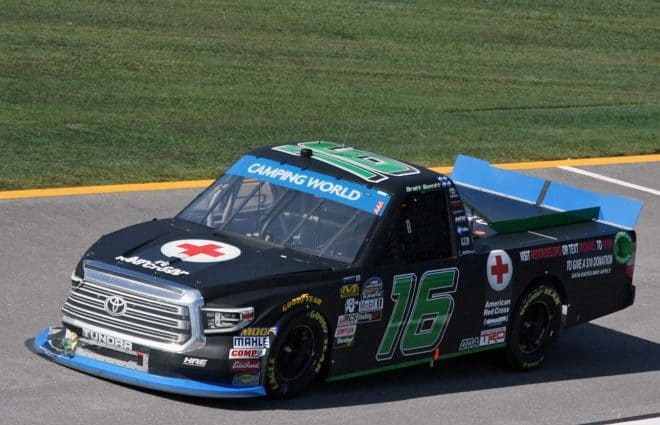 Taking his heavily damaged truck to the attention of his crew, somehow Moffitt found himself back inside the top five as the laps wound down. An unscheduled pit stop for a flat tire related to the damage the truck had suffered, dropped him to a 17th-place finish, but still had enough of a cushion to keep his title hopes alive. The No. 16 team is another one I expect to see in the Championship 4, but two finishes outside the top 10 in three races isn’t going to be enough to get the job done. Expect the team to really step up its efforts over the next few weeks. How he got here: It was a victory at Kansas Speedway in May that gave Gragson his spot in the playoffs, but consistency throughout the races leading up to the checkered flag is what gave him the playoff points he’s carried with him. The driver of the No. 18 Toyota had a knack for leading quite a few laps before giving up the track position, whether due to a pit road problem, driver error or something else entirely. Gragson was the last of the playoff drivers who hadn’t faced a single issue at Talladega when he took the white flag as the leader last weekend. That changed in a three-wide battle when he was spun off of the front bumper of eventual winner Timothy Peters. Instead of returning with a second victory and five more playoff points, Gragson’s No. 18 Toyota was hauled home on a tow truck. But nearly 50 stage points and three stage wins were enough to keep him in position to move onto the Round of 6. Given the strength of the Kyle Busch Motorsports trucks, it’s highly likely Gragson will also be a part of the Championship 4. But what’s concerning in this situation is that he’s run well enough to have multiple wins this season but hasn’t necessarily racked up the victories like his on-track performance indicates he should have. How he got here: Enfinger ran just well enough to point his way into the championship battle this season, but when it mattered most, he was able to score that elusive first victory of 2018 at Las Vegas Motor Speedway. With an automatic berth into the Round of 6, Talladega was all about trying to add to the playoff points he had. Enfinger is another driver who made it through most of Talladega without incident. In fact, he won stage 1 and was leading inside 10 laps to go, but a spin off of the front end of David Gilliland‘s No. 51, which coincidentally came not long after David’s son Todd had spun after contact with Enfinger, was enough to relegate Enfinger to a 19th-place finish, two laps down. How he got here: A breakthrough first career victory at Gateway Motorsports Park put Haley in the championship battle. What he did with the opportunity was up to him. In reality, he had run well enough most of the season to have pointed his way in, but the victory took that stress out the equation. Enter Canadian Tire Motorsports Park when KBM teammates Todd Gilliland and Noah Gragson spun out coming out of the final turn on the white flag lap there, leaving an opening for Haley to snag a win and a berth into the Round of 6, which meant two races of a lot less stress for the sophomore driver. Talladega saw Haley caught up in the Big One, though his damage wasn’t enough to keep him from finishing an impressive fourth. But now, with the next round set to get underway at Martinsville Speedway in a little over a week, the driver of the No. 24 Chevrolet finds himself on the outside looking in for the Championship 4, though that deficit is a mere four points. Given how Haley has found a way to win when he needs it the most and finishes of 10th and third in the next two races at Martinsville and Texas earlier this year, don’t be surprised if GMS Racing ends up with two drivers in the Championship 4. How he got here: For the past two seasons, the two-time Truck Series champion has struggled mightily, visiting Victory Lane just once since the beginning of the 2017 season. But what helped Crafton a lot in the first round of the playoffs was a pair of fifth-place results at Canadian Tire Motorsports Park and Las Vegas Motor Speedway, along with stage points. In fact, Crafton knew heading into Talladega that it was “more about luck than anything,” calling it “literally a roll of the dice.” And when the Big One hit, heavily damaging his No. 88 Ford and knocking him out of the race, Crafton was forced to wait until the checkered flag flew to learn his fate in the playoffs. He eked through to the Round of 6 by a mere handful of points, but unless he can find Victory Lane in one of the next three races, it’s likely his title hopes end when the Championship 4 is set. Wendell Chavous ended his Truck Series career on top at Talladega Superspeedway. Citing the need to spend more time with his family, not wanting to miss any more of his son’s budding go-kart career and taking care of his business that’s grown exponentially, Chavous announced last week that Talladega would be his final race. After making the field on owner’s points, he survived the carnage and emerged with a career-best fifth-place finish. Talk about going out on top. Aside from Chavous, four other drivers scored career-best finishes. Myatt Snider, who finished runner up to Timothy Peters, scored his third top-five result. Meanwhile, Jordan Anderson, whose previous career-best result came in the form of a ninth at Daytona to open the season, crossed the finish line seventh, scoring just his second career top 10. Bryan Dauzat and Max Tullman, who have a combined seven series starts between them, finished eighth and ninth, respectively, career highs for both. While it wasn’t a career-best finish, Austin Hill finished 10th. Though he was never much of a factor to fight for Victory Lane, the driver of the No. 02 Chevrolet for Young’s Motorsports has finished inside the top 10 five times this year — the most in a single season in the team’s history. When NASCAR released its penalty report on Wednesday afternoon, three Truck Series teams were listed in violation of Section 20.4 (Vehicle and Driver Safety Specifications: Body) of the 2018 Rule Book. The No. 02, driven by Austin Hill, the No. 52, driven by Stewart Friesen and the No. 21, driven by Johnny Sauter were all affected. The specific section of the rule book states, “Any device or ductwork that allows air to pass from one area of the interior of the vehicle to another, or to the outside of the vehicle, will not be permitted.” All three crew chiefs — Chad Kendrick, Graham Bruce and Joe Shear Jr. — were fined $5,000. Just weeks after being crowned the K&N Pro Series East champion, Tyler Ankrum will make his Truck Series debut at Martinsville Speedway. He will pilot the No. 54 Toyota for DGR-CROSLEY with crew chief Seth Smith, who guided him to the K&N championship, calling the shots.